I received a postcard from a local Estate Agent. Having shown it to a respected industry insider I’m convinced this is typical of what passes as Estate Agent canvassing. 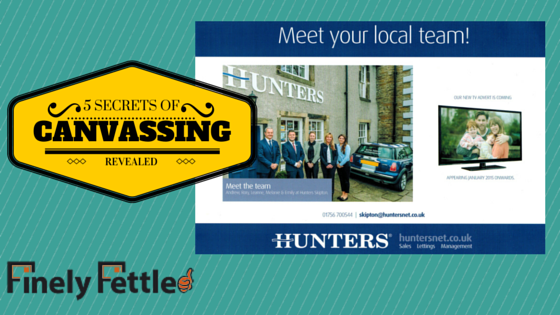 If you are an Estate Agent and do canvassing – others would use the term direct mail – then these 5 secrets may help you achieve more from your canvassing activity. Estate Agents canvassing habits are ingrained by copying others in the same industry. The problem is Estate Agents typically advertise just two things, themselves and houses. These self-image adverts, picture of the team, how great they are, the number of branches they have (it’s not that you have 100 house to sell is it?) and the fact they are planning TV advertising later this year…well, no one cares. You do not have to follow others. You do not have to treat canvassing like it was TV advertising. It isn’t. Nor should it be. Just because people know who you are does not mean they’ll call you. So how do you wean yourself off following the canvassing herd? Get to know your future customers AND prospects really well. Prospects will resonate with the benefits of recently satisfied customers, but they are some way off that aren’t they? They aren’t ready to buy are they? Pause for a moment BEFORE you decide on your next canvassing postcard and reflect on the customer problem that you’re actually solving. Do the majority of recipients want to sell their property in the next month or two? You already have done the sums I am sure. Of course they don’t. The answer lies in understanding the prospective customer and what their hot button is right now. Think of their current pains. The more accurately you can describe theses pains the more your customers and prospects will feel you automatically have the solution to their problems. But, you are used to doing self-image adverts and as you are repeating them, you must be just about making them work, right? So what else can and should you do to get much more from canvassing? Difficult one, right? Well, no-one said this was easy. Otherwise every Estate Agent would be rammed full of houses to sell and earning maximum commissions. The answer to the question is your unique selling proposition. Imagine if you conceived something that both customers and prospects really resonated with? That would be attractive. Compelling. They’d want what ever it was, wouldn’t they? So what is it? An irresistible customer and prospect benefit. Let’s test one or two from the postcard I received. Is the fact that the Agent makes extensive use of social media that irresistible customer benefit? No. That falls right into the category of so what? Okay, let’s try another. Fully trained staff? Well that’s encouraging, but its what is called a hygiene factor – a customer and prospect would expect that, so it is not irresistible. To help you here, I think you should walk outside the front door, close your eyes and open them again as a customer and again as a prospect. What are their fears, concerns and unfulfilled desires? If you can answer these questions you are on your way to creating an irresistible customer and prospect benefit. (I have some thoughts which your agency can test in this area – email me; graham @finelyfettled.co.uk). Look, it’s not a full analysis, but there is sufficient here to make you think. Here are two examples of how this mailing ignored tried and true direct marketing rules. 1. The offer was tucked away, it was weak and very easy to miss. There should always be an offer. Is this ‘FREE VALUATION’ an offer the prospect can refuse? Yep. Why? Because, I can get that offer 10 a penny. So think hard about what kind of offer will act as bait to catch the fish you want. Do customers and prospects have a specific reason to contact you, even if they are not ready or interested in a free valuation of their property? 2. There was no reason to respond right now. People procrastinate. Prospects might even be interested in having a valuation, but they put the postcard down, put it off, to do the next time they look at it. And they rarely get back to it. So to prevent having loads of the ‘almost persuaded’, consider what could make it irresistible to make that decision. Now. Right away. And the answer is not that it is free, right? Because you’ve done that to death and people aren’t queueing around the corner. Try thinking of a non-threatening incentive. That is only available for so long. Personalisation. OK, hobby horse, but typically, personalised mailings outperform non-personalised. This postcard was hand delivered, so little opportunity for personalisation. Unless, you were to hand-write the recipients name on the card and then deliver it. The practical alternative is to source clean data and personalise each postcard you send. This is not expensive, but would need to be tested against current methods. Roughly, how expensive per postcard? PS: Here’s a short video for Estate Agents about canvassing. When you are ready, get in touch with me, Graham Arrowsmith on 01535 654930. Hi, Your example of how not to do it is interesting, but do you have an example of how to do it you would be willing to share? We do a lot of A5 flyers and I wonder what one you have created looks like. I’m always happy to discuss postcards with you. If you are looking for an edge for your business, and you want a new perspective, just call me and we can take it from there.